Christopher (Toby) McLeod has been Project Director of Earth Island Institute’s Sacred Land Film Project since 1984. In 2013, he completed the four-part series Standing on Sacred Ground, which premiered on public television in April 2015. Previously, Toby produced and directed In the Light of Reverence (2001) and made three other award-winning, documentary films that were broadcast on national television: The Four Corners: A National Sacrifice Area? (1983), Downwind/Downstream (1988), and NOVA: Poison in the Rockies (1990). In 1997, he completed A Thousand Years of Ceremony, a 40-minute profile of Winnemem Wintu healer Florence Jones and her efforts to protect Mount Shasta as a sacred site—a film made specifically as an archival film for use by the Winnemem. After 10 years of work, In the Light of Reverence, was broadcast in August 2001 on the acclaimed PBS series P.O.V. (Point of View) and won a number of awards, including the Council on Foundation’s prestigious Henry Hampton Award (2005). 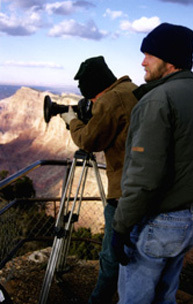 His first film was the nine-minute short, The Cracking of Glen Canyon Damn—with Edward Abbey and Earth First! McLeod has a master’s degree in journalism from U.C. Berkeley and a B.A. in American History from Yale. He is a journalist who works in film, video, print and still photography. In 1985, McLeod received a Guggenheim Fellowship for filmmaking, and his U.C. Berkeley masters thesis film Four Corners won a Student Academy Award in 1983. Toby has been working with indigenous communities as a filmmaker, journalist and photographer for 40 years. Jessica Abbe wrote and co-produced the Standing on Sacred Ground series (2014) and wrote In the Light of Reverence (2001). She authored our Run4Salmon curriculum—on efforts by the Winnemem Wintu to restore native Chinook salmon. Jessica’s other PBS documentary credits include The Roots of `Ulu (cultural preservation and food sustainability in Hawai‘i); Sea Change (indigenous efforts to protect water in Kenya and Ethiopia); Power Paths (on Independent Lens, sustainable energy development on Native American lands); and Angle of Inspiration (controversy over a bridge by renowned architect Santiago Calatrava in a small northern California city). For KRON-TV, she produced San Francisco in the 1970s and the long-running series Bay Area Backroads. Jessica has served on several educational foundation boards, and as president of the board of La Honda Pescadero Unified School District. She earned a B.F.A. at New York University, and an M.J. at U.C. Berkeley Graduate School of Journalism. Editor Quinn Costello is a freelance editor and post production supervisor from the Bay Area. He has worked on a wide variety of documentaries with an emphasis on environmentalism, social activism and issues pertaining to indigenous communities around the world. His work has been seen on PBS, The Sundance Channel and The Learning Channel. Post Production Supervisor credits include American Masters – Sam Cooke: Crossing Over. Editing credits include Mustang – Journey of Transformation, Global Focus: The New Environmentalists and the upcoming series Standing on Sacred Ground. 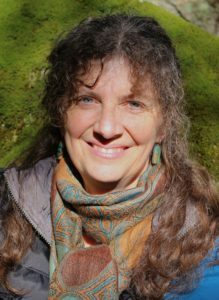 Communication Consultant Susan Alexander has provided strategic communications and fundraising advice to the Sacred Land Film Project for over 20 years. She formerly served as Vice President for Communications at the Public Media Center, a nonprofit, public interest communications agency, and Senior Strategist for Mission Minded, a branding firm that works only with nonprofits. Other positions include Vice President for Communications at Green Seal, Eco-Desk Manager for Esprit de Corp., and Communications Coordinator for the Earth Day 1990 International Headquarters. Susi worked for The Wilderness Society and as the Society’s Alaska Regional Director in Anchorage, focused on preventing oil drilling in the Arctic National Wildlife Refuge. She earned her undergraduate degree at Bryn Mawr College and a law degree at George Washington University. Callie Shanafelt, Editor and Archival Researcher, finalized the archival materials and online process for the PBS broadcast of the documentary series Standing on Sacred Ground. She also subtitled all four films in Russian and Spanish. Callie is the multi-media editor for the California Health Report (calhealthreport.org) and received the California Endowment Health Journalism Fellowship and New America Media Health Reform Fellowship in 2013. Her documentary The Fountain is about her quest to understand her father’s childhood and grandparents death at the 1950’s cult: The Wisdom, Knowledge, Faith and Love Fountain of the World. The Fountain has screened in numerous international film festivals and received the Diamond Award in the California Film Awards. Callie holds a Masters in Journalism from U.C. Berkeley. Videographer Andrew Black’s work includes documentary and feature films that have been released theatrically and broadcast on PBS, BBC, The Learning Channel, Channel 4, Sundance Channel, Discovery Channel, IFC and others. He worked with Michael Moore on Fahrenheit 911 and Sicko. He shot The Weather Underground by Sam Green, which was nominated for an Academy Award in the Documentary Feature category. He has worked with Christopher McLeod for 20 years and he annually shoots Global Focus, a PBS series that features environmentalists from around the world. Videographer Will Parrinello shot and edited In the Light of Reverence. He was director of photography for the Academy Award-nominated Tell the Truth and Run: George Seldes and the American Press and produced Emile Norman: By His Own Design, Mustang — Journey of Transformation, Dreaming of Tibet, on Tibetan refugees, and Little Italy, on Italian-American culture. He produces segments for the Goldman Environmental Prize films. Videographer Vicente Franco shot and co-directed Daughters of Danang, shot Thirst, The Judge and the General, Summer of Love, and many other documentary films. Sound Recordist David Wendlinger has worked on a range of projects worldwide for clients like the BBC, Google, Discovery and National Geographic. For the last six years he has worked on a series of short films about winners of the Goldman Prize, the environmental equivalent of the Nobel Peace prize. Finding Sacred Ground Executive Producer Dorothy FireCloud is an enrolled member of the Rosebud Sioux Tribe and has been Superintendent of Mato Tipila (Devils Tower National Monument) since 2006. She joined the federal government in 1992 as a Water Rights Specialist for the Bureau of Indian Affairs. From 1996 to 1998, she worked for the Pueblo of Zuni through an IPA developing their water rights program. She worked for the US Forest Service in from 1998 to 2006 as the SW Regional Tribal Relations Program Manager. She also served as the Team Leader of the National Implementation Team on Tribal Relations, which wrote the Forest Service consultation policy on Tribal relations. She is currently a member of the Department of Interior, Government to Government Team, which is responsible for developing a national consultation policy on Tribal relations. Production and administrative support intern Michael Preston is a member of the Winnemem Wintu tribe and a student at UC Berkeley majoring in Native American Studies. He has been working with the Sacred Land Film Project to help advance underrepresented indigenous communities, protect sacred sites and explore new possibilities in documentation of tribal knowledge. Over the last 20 years, our Advisory Board has been an essential part of the development, editing and distribution of In the Light of Reverence and production of Standing on Sacred Ground. Our Board includes Winona LaDuke of the White Earth Land Recovery Project, Chris Peters of Seventh Generation Fund, Walter Echo-Hawk of Native American Rights Fund, Dorothy FireCloud (Rosebud Sioux), Superintendent of Mato Tipila (Devils Tower National Monument), Gerald Vizenor, professor of Native American Studies at U.C. Berkeley, José Lucero of Circle of the Four Directions, ethnobotanist Donna House, anthropologist Richard Clemmer of the University of Denver, anthropologist Peter Nabokov of U.C.L.A., journalist Ben Bagdikian, anthropologist Joan Halifax, and author Barry Lopez. In our formative years we benefited greatly from guidance from the late environmental leader David Brower of Earth Island Institute, author Peter Matthiessen, author and historian Ted Roszak, and the late Tewa anthropologist Alfonso Ortiz—all four of whom have passed on.